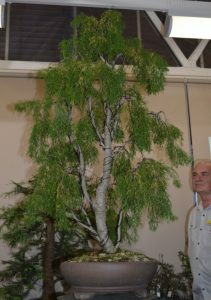 The November meeting of the VNBC had a very good member attendance, for an evening of demonstrations, discussions and broad information around the topic of Australia’s native conifers as bonsai, presented by Kevin, with repotting and styling demonstration by Marcela. 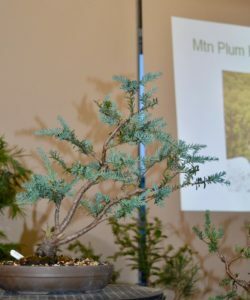 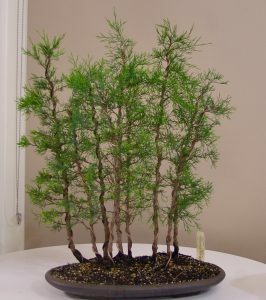 With 40 separate Australian conifer species, from 13 genera and 3 families, covering natural ecosystems from high alpine to wet rainforests to dry inland plains, and ranging from the very tall forest trees to sprawling rock-hugging shrubs, there is a wide range of possibilities for many bonsai styles. 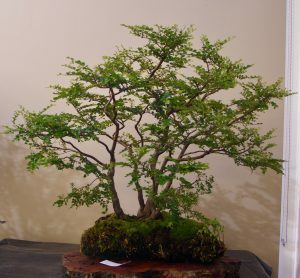 There are, however, a number of individual species growth habit challenges to deal with as well. 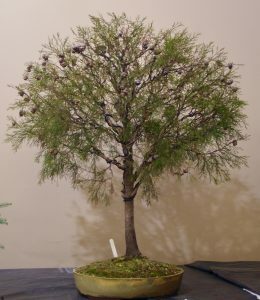 While Marcela got on with the demonstration repotting of an old Strawberry Pine (MIcrocachrys tetragona), which had long been undisturbed in a hanging basket, into a cascade style bonsai pot, Kevin presented a range of pictures and specimens, including a number brought in by members for display, of many of Australia’s conifers. 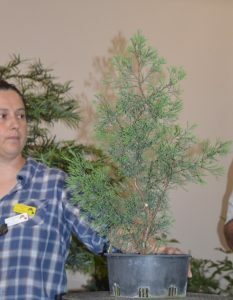 The trees discussed included, in particular, Huon Pine (Lagarostrobus franklinii), the Tasmanian Pencil Pine (Athrotaxis cupressoides) and Summit Pine (Athrotaxis laxifolia), Mountain Plum Pine (Podocarpus lawrencei), and several species of the Cypress Pines (Callitris spp). 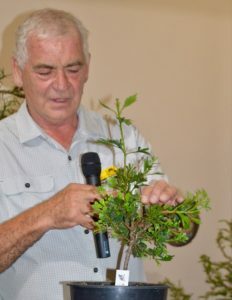 Other species which were highlighted in the presentation included the Wollemi Pine (Wollemia nobilis), Hoop Pine (Araucaria cunninghamii), Bunya Bunya Pine (Araucaria bidwillii), Queensland Kauri (Agathis robusta), Strawberry Pine (Microcachrys tetragona), Celery Top Pine (Phyllocladus asplenifolius), and the Black Pine (Prumnopitys ladei). 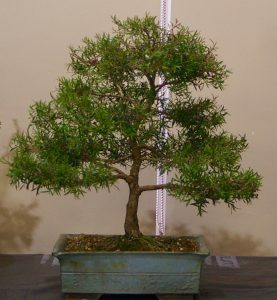 Tea Tree, Leptospermum sp., and what an interesting pot! 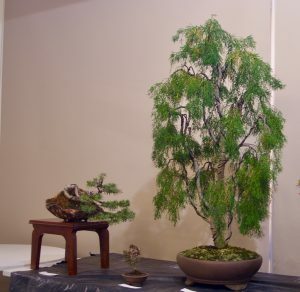 Large Huon Pine with smaller windswept Melaleuca virens, and mini Leptospermum sp.